‘The Peanuts Movie’ is a children’s Animated Comedy following Charlie Brown and Snoopy as they each go on their own little adventure, one to defeat the evil ‘Red Baron’ and the other to try and win over the love of his life. Firstly, i really really enjoyed this movie, this was such a pleasant surprise to watch and i had a smile on my face pretty much the whole way through. This was definitely one of the biggest surprises of the year for me, i expected this to be a very childish film that would only appeal to young kids and try to draw in those who grew up with these characters. I really thought i was just going to have to try to survive through it and then be done with it, but i don’t believe how much fun i had watching this movie. It was immensely funny, had great emotion, great characters and chemistry, a great score/soundtrack, and an interesting yet repetitive plot that kept me intrigued. My past experiences with ‘Peanuts’ is limited to knowing basically who Charlie Brown and Snoopy are, and you can definitely still enjoy this even if you don’t have an attachment to the property. One of the biggest things that makes animated movies successful is including elements that an older audience can really enjoy, as ‘Pixar’ have done so well. And when an animated film doesn’t do that it really isn’t enjoyable to anyone over like 10, it doesn’t mean the film is a failure but it should aim to attract an audience outside of the little kids who are going to see it regardless of what its about. This film accomplished that really well, it was a very charming film with plenty of laughs and many positive and uplifting moments that i couldn’t help but to smile at. The animation style combined with many unpredictably funny moments made for a very good time watching this movie. I thought they balanced the use of comedy with the more plot driven, emotional moments very well, and a lot of that was due to Snoopy. Snoopy is such a loveable cute character and whenever he was onscreen playing around, they happened to be some of my favourite moments of the film. The plot of the film was simple and a little predictable in that you knew how it was going to end, but there were a few surprises here and there that i liked and kept me interested. It did get a little repetitive by the last 20 minutes, but being aimed at kids, you can’t knock them down that much for a simple and repetitive plot. Somehow i don’t think an ‘Interstellar’ style of plot in a Peanuts movie would go very well. The other thing i really thought was a huge positive for the film was the great score by Christophe Beck. Beck, is in no way a household name when it comes to memorable scores but hearing work like this makes me want to hear more of what he can do. The score was very uplifting and kept a very positive and adventurous tone the whole way through. 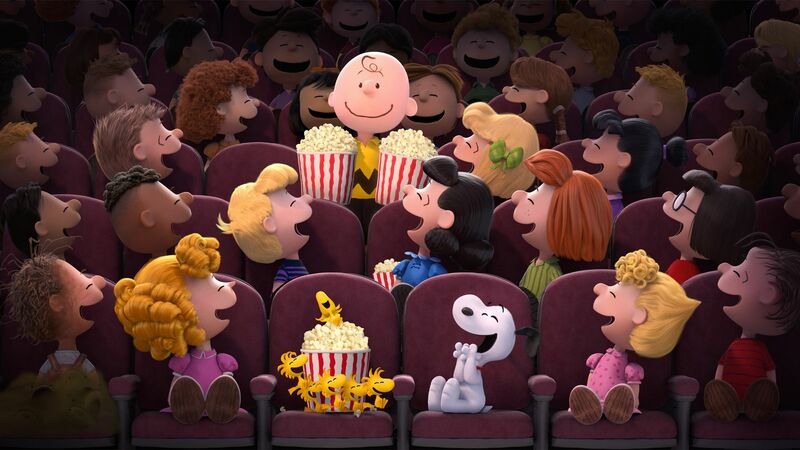 In the end, peanuts was an enjoyable movie filled with emotion, funny moments, great characters and a fun time for people of all ages. It had a very positive and light-hearted tone that made this a very fun film and one of the strongest animated films of the year.